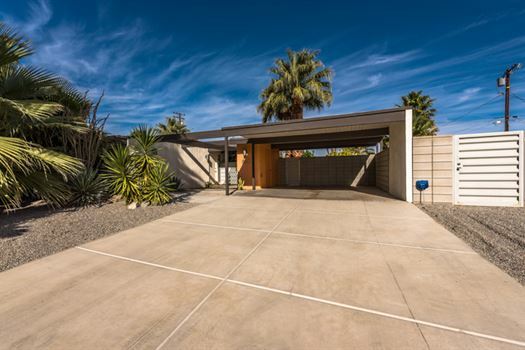 Classic mid century lines and elegant modern style are featured in this 1960 Krisel designed home. 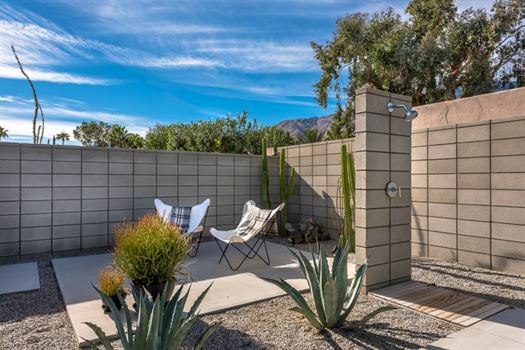 Showcasing architectural lines and stunning mountain views, you can enjoy complete privacy in a fully enclosed back yard. 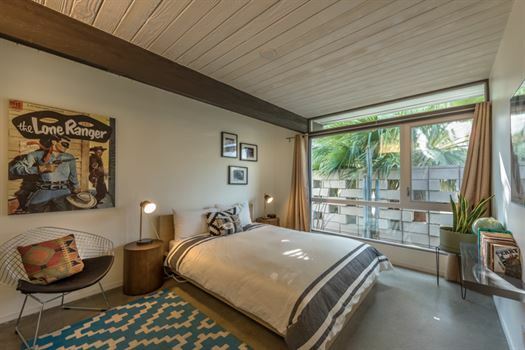 Sharp lines, Mid Century modern furniture and polished concrete floors fill the house with a feeling of cool understated style. A large ¼ acre lot provides privacy and tranquility. 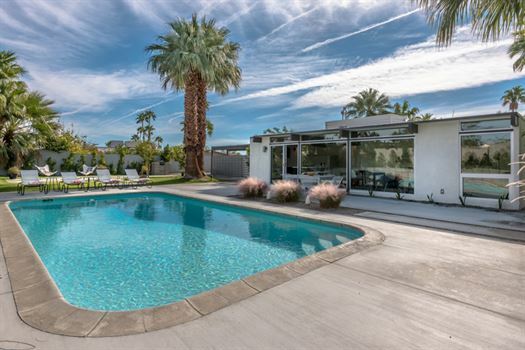 An abundance of clerestory and patio windows provide amazing views of the pool and mountain. 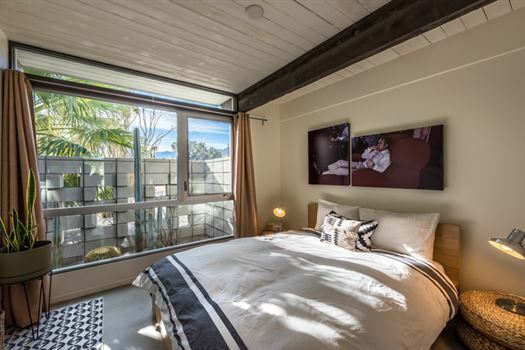 Relax in peace and quiet in a private courtyard off the master suite with amazing views. Swim in the sparkling pool or layout in the sun. 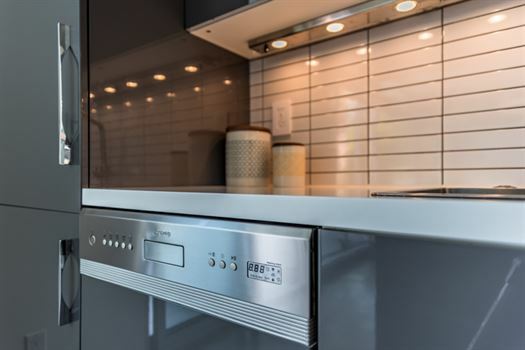 A deluxe kitchen features, glass tiles, stainless steel appliances. A generous island with pull up stools provide plenty of room for entertaining. 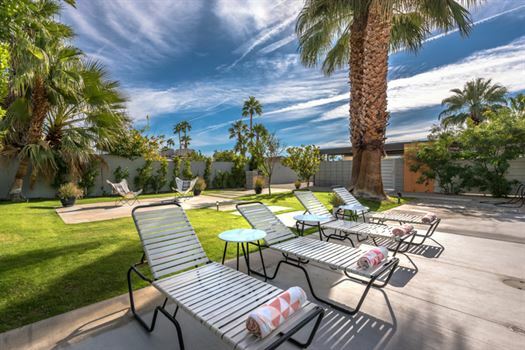 Our stay at Spencer Modern was an excellent Palm Springs experience. The home is located far enough from downtown to avoid the congestion but close enough to walk to the impressive Uptown district. The home itself is in great condition with an open layout and a terrific outdoor space and pool. 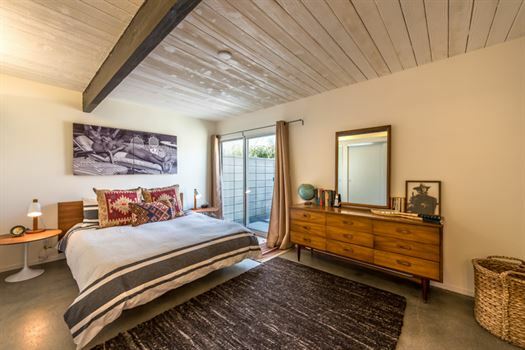 The neighborhood offers a first-rate mid-century modern home DIY walking tour. 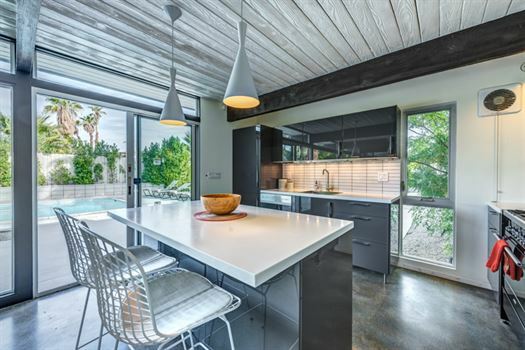 Spencer Modern is a great home and a fine rental value. 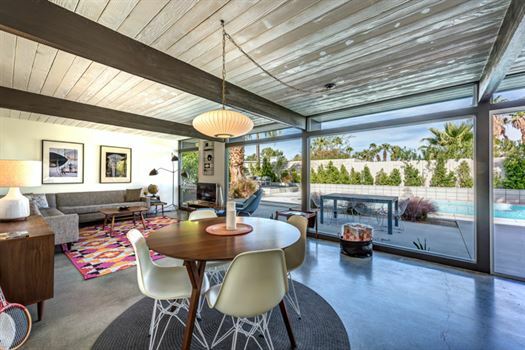 We had one of the best times ever in this beautiful Mid Century Modern home! 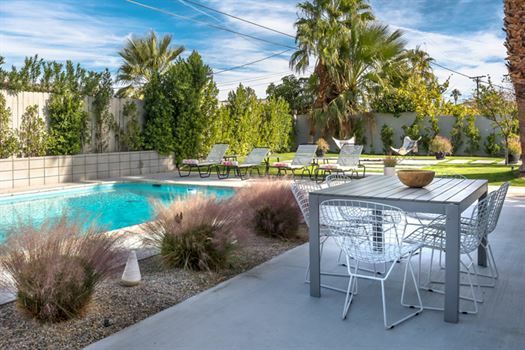 This home offers a beautiful pool and spacious back yard. The home is very bright, clean, and meticulously maintained. It’s close to great restaurants, bars, and retail shopping. Eric the property manager was extremely helpful, and quick to respond if we had any questions. By far one of the best experiences we’ve had! We’ll definitely be back. 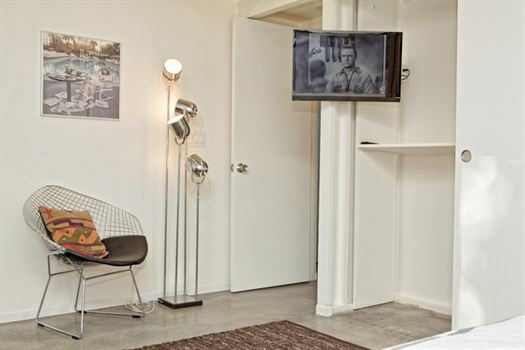 The Spencer Modern property was perfect for a week-long retreat among friends! 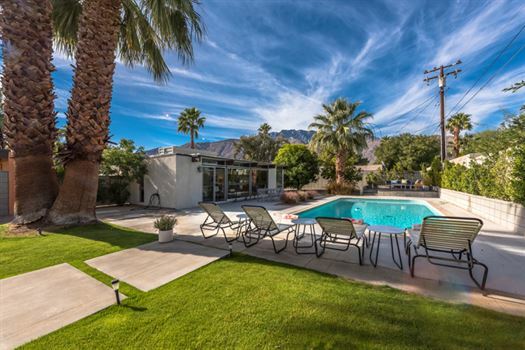 We have stayed at a number of Palm Springs properties in the Racquet Club Estates and Vista Las Palmas neighborhoods, and this house ranks as one of the best. 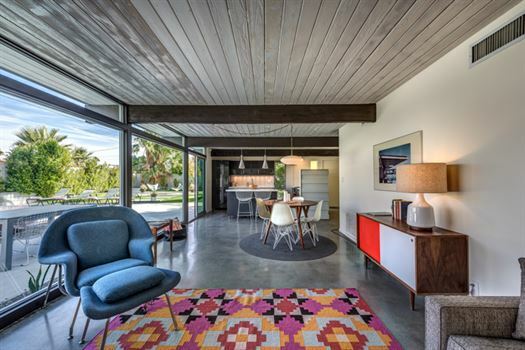 The renovation materials and furnishings were inviting and aesthetically respectful of the mid-century bones of the house. Beds and linens comfortable and just the right weight for desert slumber. The pool area was especially nice--plenty of open spaces for gathering or just lying by the pool, with full sun exposure and shade options at all times. Our house manager was friendly and accessible--he even dropped off a pumpkin pie wishing us a happy Thanksgiving. 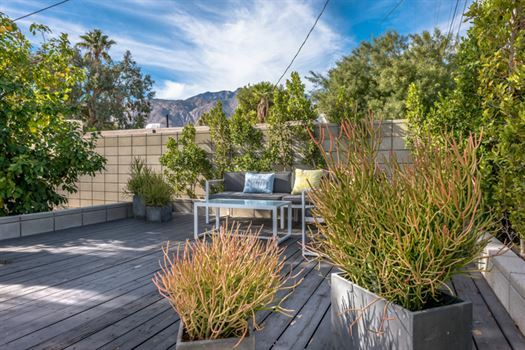 And location, location, location--so convenient to downtown and the growing North Palm Canyon area. We'll be back! We really enjoyed our time at Spencer Modern. We appreciated excellent service from being let into the house to helping us out when the barbecue was not working. We also appreciate that you looked into the pool temperature. Although the pool was at 86 degrees, during the cloudy and cold days it felt too cold for us to use often and that was a bit of a disappointment. Otherwise we had a very pleasant stay. We stayed at this 3 bedroom home with our two year old twins and it was the perfect spot. The house itself had everything we needed - spacious living area, well appointed kitchen, multiple outdoor areas and a great pool. 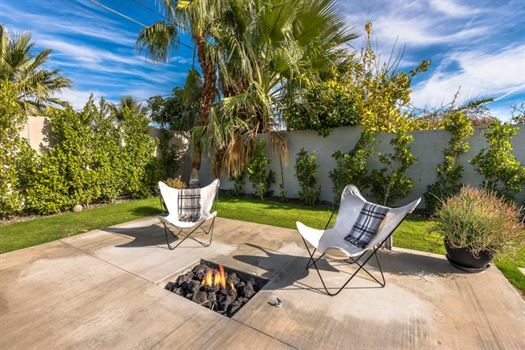 The location was highly accessible - we were able to get anywhere we wanted with ease whether on the freeway or city streets, and a large grocery store was only a mile away. It was a good launching off point for bike rides north of the city, and was a quiet neighborhood. The Oasis team was equally impressive - the house was clean and beautifully appointed, we were greeted on arrival, and incidentals like extra towels, sheets and blankets, pool floaties, etc, were all covered. Thanks for a great trip - we will certainly use Oasis again on our next visit. Beautiful, we'll kept modern house. Quiet, clean, we'll furnished. 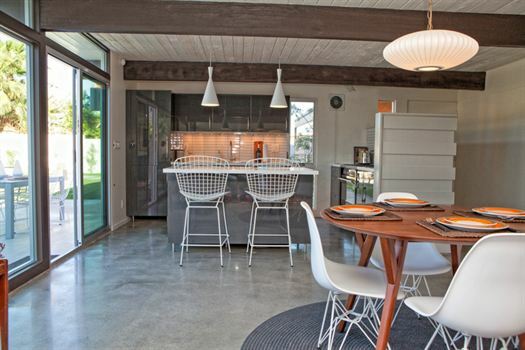 Would recommend it to anyone who enjoys modern design, mid century style. Fantastic house. Great service on arrival and departure. All very easy. Loved the pool and backyard. The house and furniture high quality and true to the period. We loved the Spencer Modern, great house, clean, comfortable, stylish and a huge patio and pool! Would def stay there again! Great house! Chris and the Oasis Rentals team were easy to chat with and get a hold of. They answered all of our questions. Eva was there to meet us at the house, give us the tour and show us how to work the TV, washer/dryer, fire pit, grill, etc. The house was perfect for the 6 of us - 2 in each bedroom. The living space is well designed - stylish and comfortable. Kitchen was perfect for breakfasts and late night snacks. The real gem in the house is the back yard. The pool gets sun all day (we did have to move our chairs around a bit - a beautiful palm tree is there for shade if desired) the fire pit was perfect for the windy nights. We are breakfast outside at the table and had cocktails at the outdoor lounge in the evening. There is an outdoor shower too :) Highly recommend this house and would gladly stay there again on a family vacation, business trip or another girls getaway. The house is in a residential area about 3 minutes from a grocery store and 10 minutes from the restaurants, bars and shops of downtown. The house had everything we needed! Eva was there to greet us and give us a tour. communication with her prior to/during our stay was very easy. The backyard was the highlight!! We spent the entire weekend enjoying the pool and BBQing. The house had everything we needed! Very comfortable and pleasant stay at Spencer Modern in Palm Springs. Communication was friendly, fast and efficient. House was very clean and well equipped. I spent a very comfortable three nights at Spencer Modern. Everything was as described. House was well prepared and very clean and well equipped. 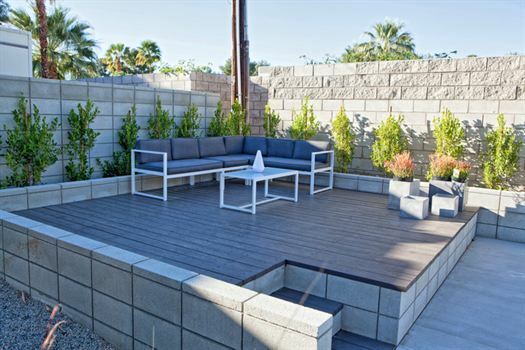 The outside space is very private and peaceful. A charming property. We're already looking forward to our next visit. Eva was easy to communicate with and was present as needed for arrival, during and departure of our stay. 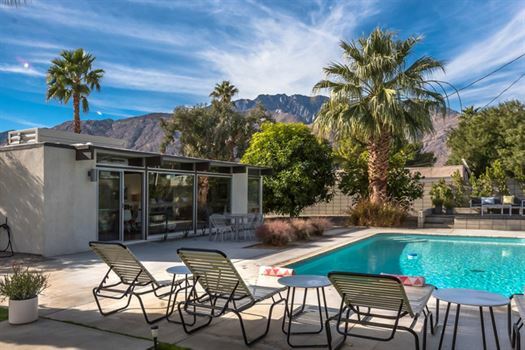 The home far exceeded our expectations and made it so that we spent more time at home than exploring Palm Springs itself. The amenities were wonderful, clean and in great condition. We're already looking forward to our next visit. 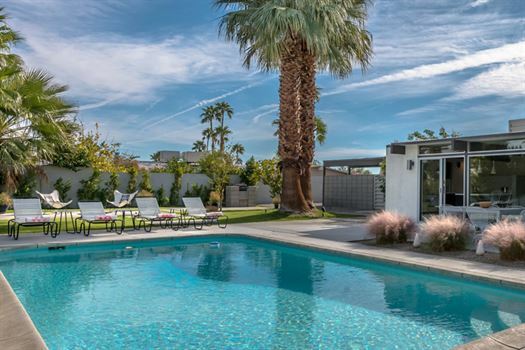 Weekend 2 of Coachella, our party of 5 rented the Spencer Modern home. The home has all the amenities you would need for a long weekend. We had a wonderful stay and will definitely stay there again! This house is lovely! The house is very well stocked with essentials: pool towels, kitchen essentials, extra bedding, blankets, throw pillows, shampoo and conditioner, and even floaties for the pool and entertainment system was up-to-date and user friendly. The property manager noticed the cable box was acting up & he brought us a new one at check it and installed it in like 10 seconds! The house has been renovated and restored with extreme attention to detail. Every finish, door-handle, appliance, tile, etc is well chosen and luxurious. Everything was super-clean - even the pool. We were a group of 5 and it was plenty of space. I can't wait to stay here again! It's a great property inside and out. We loved the decor and furniture. The pool is just right and for sun sensitive people like myself because there is a fair amount of shade over enough of the pool throughout the day to avoid sun burns. Minor glitches: The coffee maker is evil. 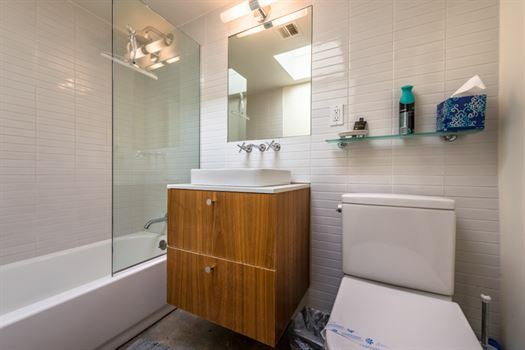 Privacy is tough because the concrete floors and close proximity of bathrooms to bedrooms amplify a LOT of noises. 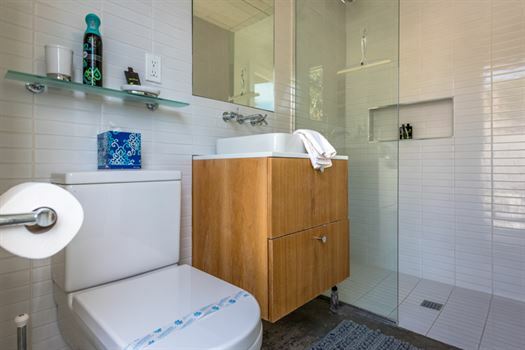 There is an exterior door in the master bath that is a full length window. It would be perfect except for the creepy RV next door that presents a direct line of sight into the bathroom IF someone were in it. The fridge is relatively small. Those are minor details as you should be enjoying the great yard and pool all day long until you go to bed. If you're inside the AC works great, the furniture is comfortable and the cable TV and sound bar make for a nice escape when the winds pick up outside. I'd certainly rent it again. Great stay at a great property. Great experience staying at the Spencer Modern. Beautiful, clean home with great furnishings, lovely pool, and ample amenities (towels, soap, washer/dryer, etc.). Master bed is a bit firm, but not uncomfortably so. Close to the grocery store, and a quick uber ride into town. A/C went down on the final morning, even after adhering to the posted directions to, but spoke with the property manager and she understood, so I imagine the extreme heat of Palm Springs in the summer overworks the unit regularly. Other than that small hiccup, everything was excellent and I would definitely suggest a stay at Spencer Modern.